I kept running into Rhiannon Giddens on the internet yesterday, and it made me think about the days when she lived in Greensboro. I don’t know whether she ever lived in College Hill; perhaps she was like EmmyLou Harris, just dropping in to the neighborhood to sing a bit now and then before going on to her brilliant future. Around 2004 Rhiannon was a regular participant in what was then the 9:20 service at the Presbyterian Church of the Covenant. She offered thoughtful comments during the group discussions, and she sang once, maybe more than once. Her voice was a revelation for everyone, I think; her singing provided a “what’s-she-doing-here” moment. And, sure enough, soon she moved away from Greensboro. The next we heard of her, she and the Carolina Chocolate Drops were getting famous and, in 2011, winning a Grammy. A week-old email I opened yesterday from the Carolina Theatre listed her June 8 concert there among its coming attractions. And while looking for something else online, I happened to see that the All Music Guide was featuring a glowing review of her new album, “Freedom Highway,” one of many excellent reviews it has received (“A timely, arresting album,” The Guardian). Wouldn’t Johnny Cash have just loved her? 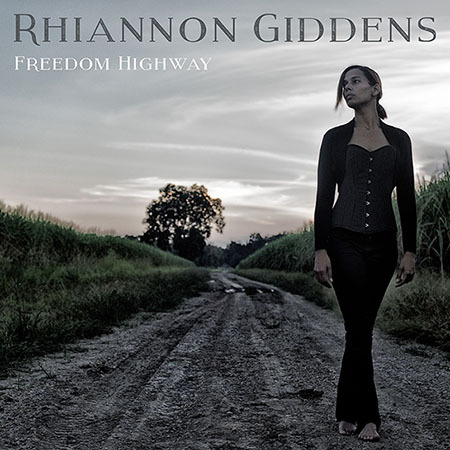 This entry was posted in Presbyterian Church of the Covenant and tagged Freedom Highway, Rhiannon Giddens. Bookmark the permalink. I met Rhiannon years ago when she was a teenager. She was my late friend’s Goddaughter……..how proud my friend would be now. Rhiannon and her husband were attending Presbyterian Church of the Covenant when I started coming there in 2005. In fact, Rhiannon was the one that first invited me to check out the 9:20 service at PCOC. She and her husband were also married at the church. It is my understanding that she rented space from Laurelyn Dossett when she attended UNCG and has a home in McLeansville. She has come a long way with her music in the past decade and it is my understanding that she is appearing in the TV series “Nashville”. She and her husband are very special people.